Kingfish – also known as king mackerel – are a prize catch for recreational fishermen, requiring strategy and skill. Kingfish are robust, aggressive fish that have been observed leaping out of the water in pursuit of prey. Their ferocity transfers to a rich flavor that provides a tasty dish for your diners. Laden with omega-3 fatty acids, the kingfish also makes a very healthy choice. The history of the kingfish fishery provides an excellent success story of sustainability that your customers will love to hear. Kingfish packs a powerful flavor but it is surprisingly adaptable to many different recipes, lending your chef the option to add a variety of options to your menu. 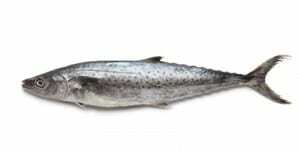 It is a dark, oily fish many chefs will enjoy grilling or smoking into steaks or fillets. Your diners will be pleasantly pleased with kingfish that is breaded and fried, baked with fresh vegetables and a drizzle of olive oil for a healthy Mediterranean dish, or sliced delicately and served as sashimi. If your customers love tuna and swordfish, they will adore kingfish. Commercial fishermen have been catching kingfish since the 1880s, but the fisheries were completely unregulated prior to the 1980s. Airplanes were once used to find schools of mackerel and report their location to large commercial vessels. Federal regulators recognized that wild stocks were depleted and set restrictions in place in the 1980s that were designed to help rebuild kingfish populations. An increasing number of management measures have been set in place over the years, including limits on how many kingfish could be harvested and the location of where they could be fished. Today the wild fisheries of kingfish are abundant and support both commercial and recreational fishermen. The history of the kingfish fishery is an outstanding model of proper management. We love to celebrate the success stories in the seafood industry and the kingfish is a shining example of the creation of a sustainable industry. Effective management is vital to keeping our oceans healthy and our seafood supply plentiful. By purchasing products from Pucci Foods, your business is supporting our oceans and creating a better future for all. Order your wholesale kingfish by filling out the form on this page and a member of our teach will be in touch right away.